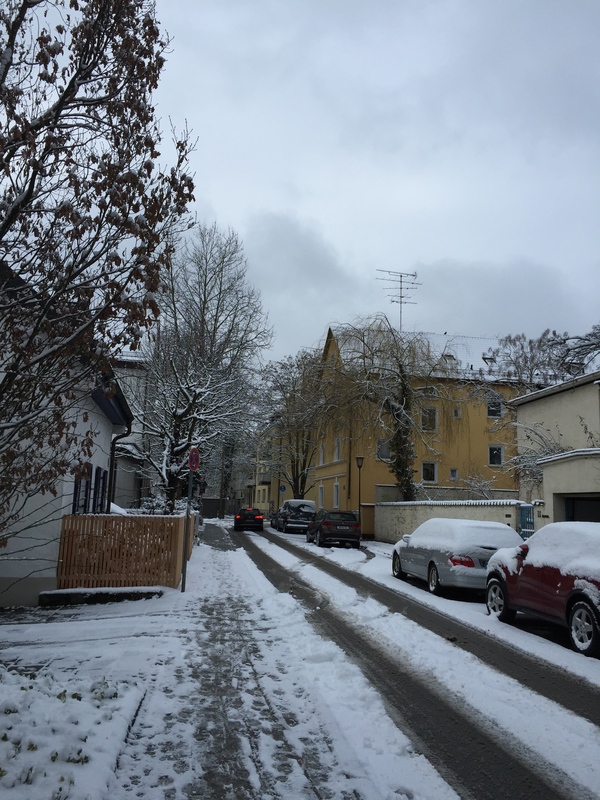 I’ve been in Munich for about 36 hours. 3 museums, 8 miles, 0 pretzels, 1 yoga class, and about 100 dankes. I kind of love it here. I know it’s easy to make such bold statements after a very short amount of time—couldn’t the same be said of just about anywhere after only a couple of days? Er, no. But I have thought the same of Tokyo, Istanbul, Los Angeles, San Francisco, Hong Kong. How many cities have three different Jivamukti Yoga studios? Come. On. Parts of the city have felt like Brooklyn to me, others like Rome, and parts that have felt like no other place I’ve been. And there’s no dog crap on the ground. Anywhere. Back home in New York, my friend Misha has been singing Germany’s praises for years, from Berlin to Hamburg. I’d never been to Germany so I didn’t get it. I’ve often teased him that, as Jews (part-Jew in my case), we just aren’t supposed to like it here. But that sentiment is so off, limited, antithetical to my core, yet still. I know plenty of Jews in the U.S. who don’t so much as to like hearing German being spoken within earshot. Understandable of course to a certain generation. (And i wonder how many Jewish expats there are here. So far all the expats I’ve met are decidedly not Jewish.) 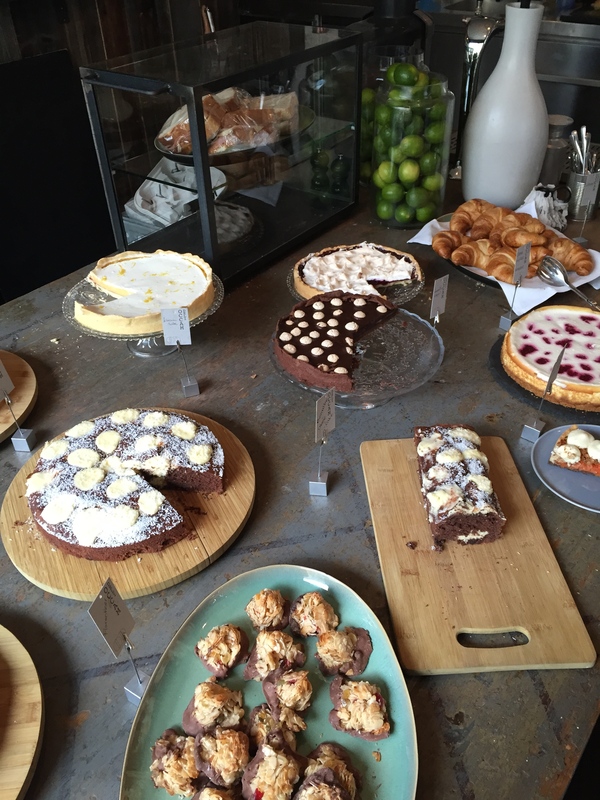 And yet, walking around the English Garden this afternoon I felt at home; strolling through Schwabing, going to yoga, eating brunch at Occam Deli, I constantly felt both unfamiliar and familiar. Or maybe it’s just because, as Monocle magazine declared, this city is just so freaking livable. As a U.S.’er I find it’s important to get out of the States as much as one can. Roam abroad. Hear other languages being spoken. I live in Brooklyn and hear and see many cultures around me all the time. But there is intrinsic value in leaving one’s land (especially if that land is the U.S.), to breathe different air, to fumble with the language being spoken (especially if you only speak English). It’s humbling, if nothing else. There has been so much to like in my short time here so far. I did a lightning round of museum touring yesterday afternoon coming off an eight-hour redeye from JFK. 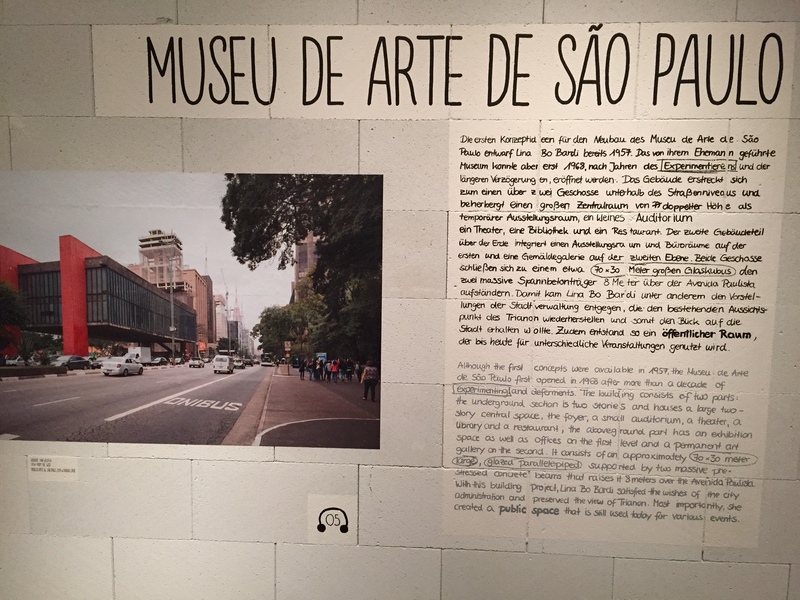 -At the Pinakothek der Moderne, the Linna Bo Bardi architecture show: “Brazil’s Alternative Path to Modernism.” She was a badass architect ahead of her time (see photos below), practicing architecture in an all-boy’s club in the 40s, 50s, 60s, and 70s, building large public buildings and private residences in Sao Paolo and beyond. It’s an architecture povera — not impoverished, but simple, for the people, unfussy, and super integrated its environments whether forest or concrete. 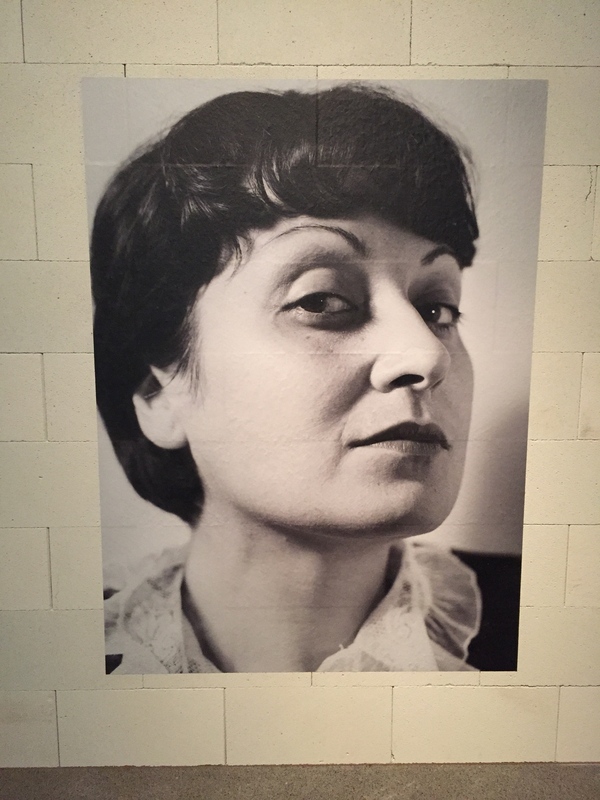 The exhibition design was unusual too – exhibition povera. Wall text that was handwritten on the walls, sometimes with errors crossed out in plain sight, beautiful models, and Brazilian music. I thought, there really should be more music curated into visual art shows. -The Canaletto show at the Alte Pinakothek. (For 12 Euro you can get into 3 of the Pinakotheks on the same day.) Born Giovanni Antonio Canal in Venice, he masterfully painted sweeping landscapes throughout the 18th century. You could spend an hour taking in each canvas. Master of light, shadow, detail. 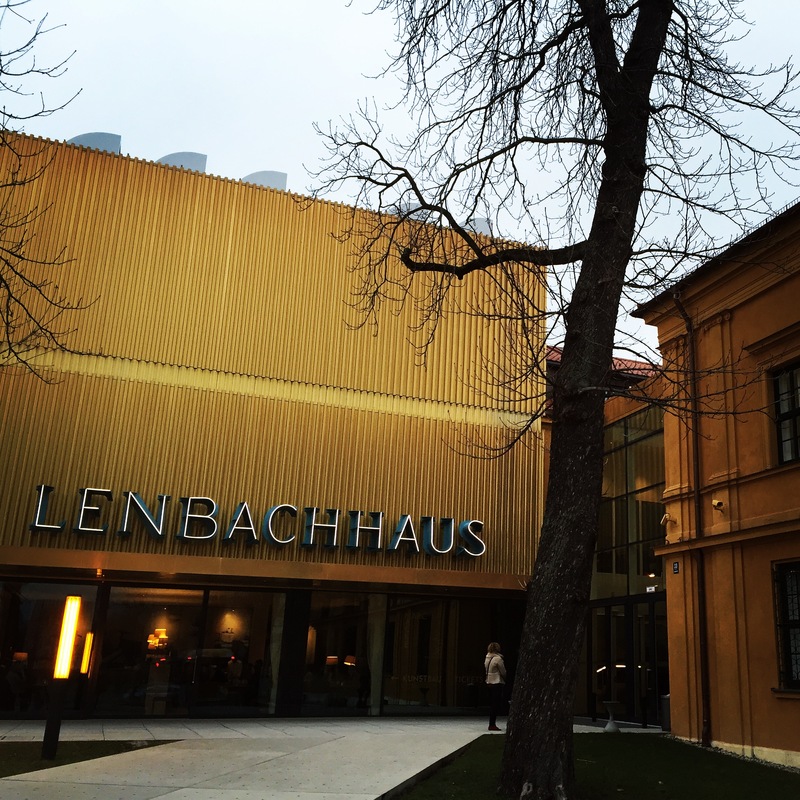 -The Lenbachhaus! 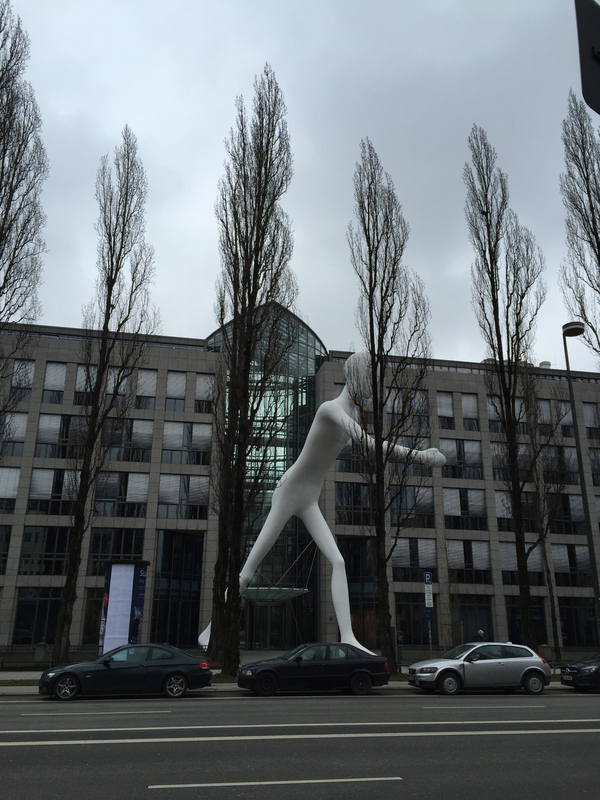 Home of the world’s largest der Blaue Reiter (Blue Rider) art collection. Turns out, I do still like Kandinsky. I just hadn’t seen as much of this early stuff, very folksy, not precise at all, with chunky sweeps of oil paint crossing the canvas. Below is a photo of the new addition, built in 2012 by Norman Foster, signage by Thomas Demand. 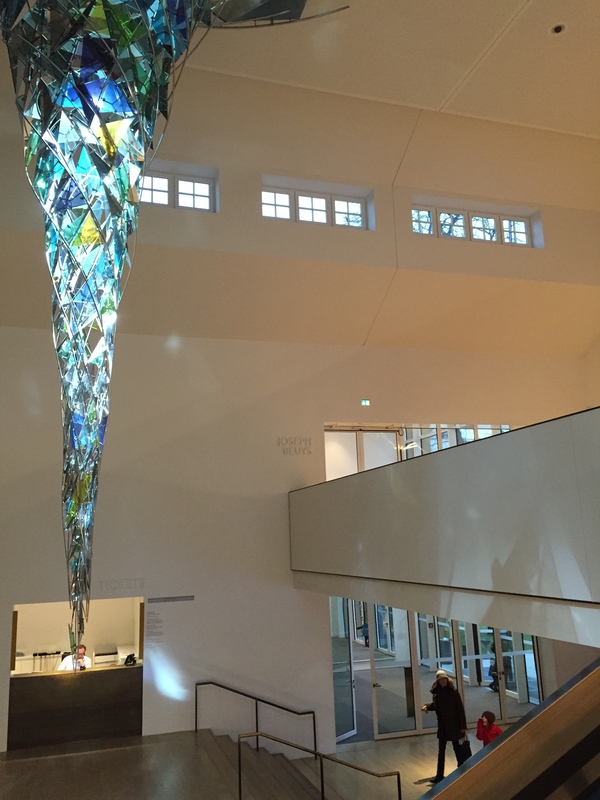 Below that a photo of the interior lobby with a permanent installation by Olafur Eliasson. 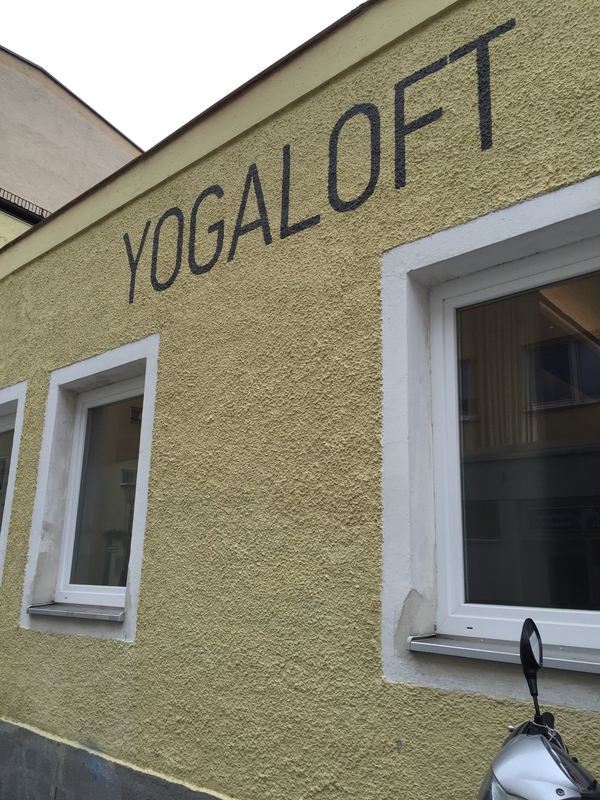 This morning I attended a class at the Yoga Loft, taught by the lovely Kari. 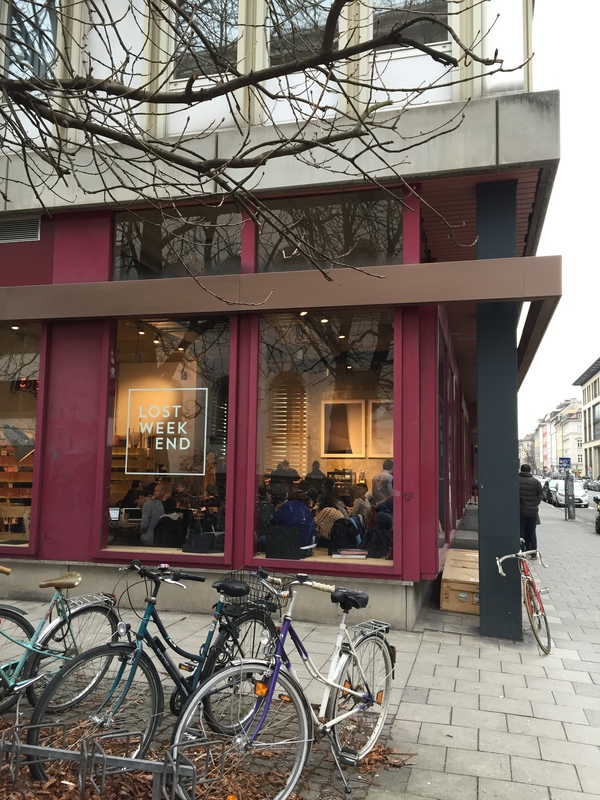 She told me the buchhandel & coffeeshop I liked so much yesterday—Lost Weekend—was opened by one of the Jivamukti founders here. Of course. Hip setup, vegan food, good music, students on Macbook Airs, well-curated artsy book shop. 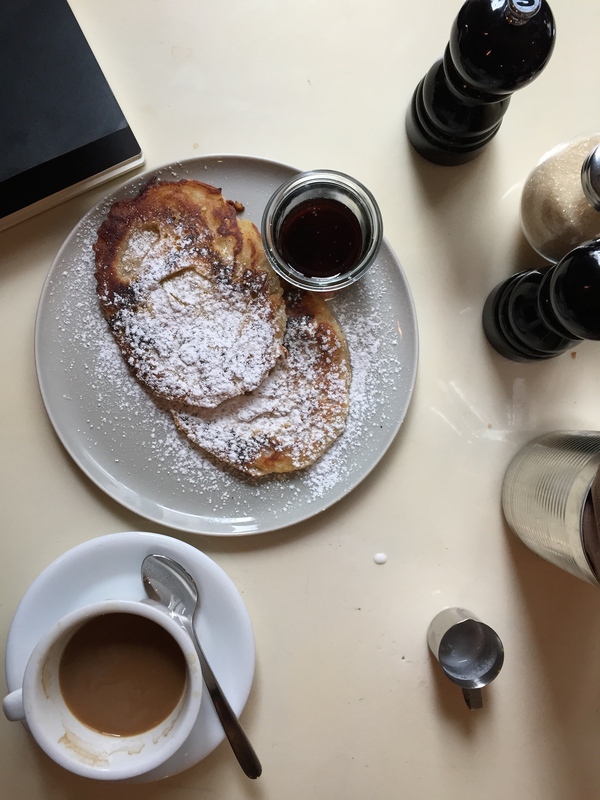 Today, eating pancakes at Occam Deli in Scwhabing (where the photo above was taken), I watched an older woman (in her early seventies I’d say) eating a plate of bread, cheese, and gherkins while listening to music from her iPhone on rather large white headphones, flipping through a fashion magazine contentedly. I wish I had gotten a photo. If this place had been in Fort Greene or Park Slope in Brooklyn there would only be people 25–45 years old. Not here. The ages ranged from about one to eighty. That’s all for now, tomorrow I start meetings at Prestel, where I recently began a new job as full-time Acquisitions Editor. I’ll be back to this city at least twice a year. Thankfully. Because it doesn’t look like I’ll be making it to the Haus der Kunst or the Brandhorst Museum or or so many other things this trip. Peace out, as they say in German.